The general cargo ship VTB 36 caught fire on Thi Vai river in Vietnam. 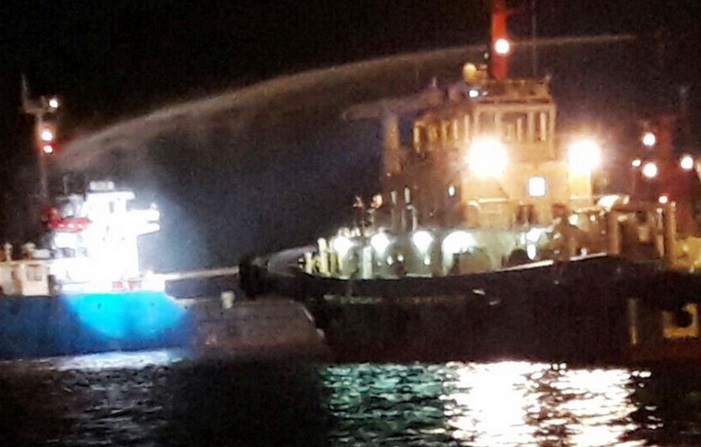 The vessel was carrying 4,630 tons of maize upstream the river en route from Cai Mep to Qui Nhon, when the superstructure was engulfed by flames. The crew was unable to get control of the fire and reported the accident the the local authorities, requesting immediate assistance. The local Coast Guard station dispatched two rescue boats and five tugs to assist with firefighting and evacuated the 12 crew members, two passengers and two pilots from the ship. The fire was was extinguished during the night and the vessel was towed to the anchorage of Phuoc Hoa in the Tan Thanh District. The superstructure of the general cargo ship VTB 36 was largely gutted. The investigation for the root cause of the fire is under way. According to preliminary information, the fire started after short circuit from personal appliances in crew cabin. The firefighters will inspect the ship and find the source of the fire. Fortunately during the accident there were no injured people and no water pollution. The general cargo ship VTB 36 (IMO: 9577331) has overall length of 92.00 m, moulded beam of 15.00 m and maximum draft of 4.00 m. The deadweight of the vessel is 5,193 DWT and the gross tonnage is 2,998 GRT. The ship was built in 2010 by Vinashin Nam Ha Shipyard in Nam Dinh, Vietnam.